Much is being made in our little corner of the world of Forrester’s recent decision to require its analysts to publish to Forrester blogs rather than individually branded and managed properties. So much so, in fact, that I’ve been asked about it more than once. Hence the following commentary. Please be aware, however, that in assessing the merits of Forrester’s decision, I’m limited by a distinct lack of primary data. It’s also worth disclosing, for those that aren’t aware, that we are nominally in the same business as Forrester. The following, then, should be taken with a grain or three of salt. But in looking at whether this is the right move for Forrester, it’s necessary to first establish what metrics you would use to judge. My own are simple: economic return. Through that lens, I would walk through what we do know. It’s common knowledge, for example, that Forrester has in recent years seen analysts use personal properties to build their own reputations, which were then used as a launchpad for other ventures. And it seems probable, as has been claimed, that Forrester, as is typical in service based models, extracted a significant margin from those premium employees during their tenure with the firm. Those whose business it is to track such things tell me, as well, that Forrester’s brand benefited significantly from the now departed employees’ tenures. The transaction accounting then might look something like this: the employer profited first on the margin, second on the additional volume, and last on the less measurable, but no less important, brand awareness. The employees, meanwhile, were presumably compensated at a rate commensurate with their talents, if well short of their premium status. It can probably be assumed that their individual brands profited from their experiences and exposure at Forrester, given how successfully the positions have been leveraged into other opportunities. Setting the departures of these individual brands aside for a moment, the relationship then looks like a win for both parties. As we know from the defections, however, the alignment of the individual and corporate agendas was a temporary condition. The conventional wisdom seems to argue that this is a win for the employees and a loss for the employer. But is that accurate? In asking the question, I’m clearly focusing on the latter contention: few would dispute, I think, that the employees would consider their post-Forrester careers anything but a win. Has Forrester lost, though? The answer to that question seems to lie in the economics, and I think the case can be made that Forrester’s actually better off. Intending no disrespect to the departed analysts, of course, who are uniformly excellent in my experience. Consider the economics of the analyst business: essentially you’re selling time. You can attempt to scale this through various mechanisms – rich media, webinars, reports, and the like – but ultimately the human asset scales poorly. You offset the asset cost – salary and benefits – via a variety of billing models, whether that’s packaged productions or custom consulting time. But as the visibility and stature of the analyst increases, the cost in salary can grow geometrically. Meaning that your margin on that asset will decrease over time, unless you can either scale him or her linnearly, or grow the analyst pricing at the same rate. Given the economy, the latter seems unlikely. And the former is always a challenge. Essentially, this means that an analyst’s value as an economic asset should not be expected to grow in a straight line. Paradoxical as it might seem, it’s entirely possible that as an analyst’s experience and visibility grows, his or her value in an economic sense may actually plateau or decline. Because while you can bill him or her for more, you have to pay them at a premium that may eventually exceed the acceptable margins. In other words, your best analysts may not always be your most profitable analysts. Top heavy law firms everywhere illustrate this principle quite adequately. If Forrester could be said to win via the departures of these analysts, however, the new policy may well be an error. The point of the above is not that premium talent is somehow to be avoided. Far from it: premium talent must be actively cultivated, because it will in turn command a premium price. More to the point, who gets excited about engaging with a firm composed strictly of average talent? The question, rather, is whether or not premium talent is a sustainable model over time. I would argue, and certainly the history of any number of services businesses – think Law – would agree, that it is not. You need to acquire and grow stars constantly to replace those lost through natural or unnatural attrition. But Forrester’s policy could well act to inhibit the growth of the next stars, by dissolving them into a larger population of voices from which it will be more difficult to differentiate. As bright and talented as many of the Forrester analysts I know are, it’s difficult to make stars of your people when they’re just another one of your people. The problem with the no star model isn’t that the stars leave; that’s natural, expected and arguably good for the parent firm. The problem is when you’re failing to produce new ones. It’s not clear that the Forrester plan will, by itself, cause this. But as an analyst, it would make me think twice. As for RedMonk, while Dennis Howlett and Jonny Bentwood very kindly set us up in opposition to Forrester in this case, the funny thing is that from an infrastructure perspective we actually look a lot like what Forrester is proposing. Our blogs are all centrally hosted, and each one carries a RedMonk brand links back to our other properties. To Dennis and Jonny’s point, however, that’s where I think the similarities end. We very actively want to cultivate individual voices and invidiual brands – via Twitter and elsewhere, and I think we’ve had some modest success doing so. Our view is that value that accrues to one of us will inevitably accrue to RedMonk, whether the connection is direct or otherwise. I can’t imagine policing our employees personal blogs, podcasts or properties for work related content, because it’s a negative for the employee and unlikely to be of benefit to us. Of course it’s somewhat easier for us to be ourselves, given that our target audience are themselves individuals. 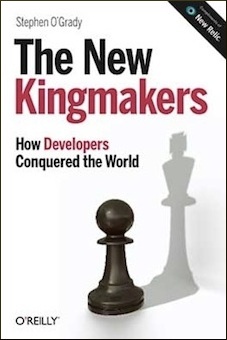 The developer communities that we exist to learn from, advocate for and agitate on behalf of would be unlikely to welcome a more homogenized, corporate brand-focused approach. But to each their own, because what works for us may play poorly for the big guys, and vice versa. Either way, it will be interesting to watch how Forrester’s plan plays out over time. Interesting debate. I liken it to how some of my colleagues work to band themselves within the scope of their work. By enlarge the corporate policy is that, as long as it does not work contrary to one’s employment and a necessary disclaimer is present, blogs, and for those that choose, self branding is acceptable outside that corporate umbrella. Part of why this isn’t a zero-sum game is that the analyst will work harder (e.g. late at night) on a personally-branded blog than they will on a company blog. Out of all the pieces that I’ve read on this subject, yours is by far and away the most considered and thoughtful. Thank you. Good analysis. Resonates well with our view at Freeform. Nothing to add. @Glen: indeed. personal brand is always going to be a factor, and artificially stifling that might benefit the firm in the short term at the expense of the long. firms that don’t make stars of their people will, inevitably, lack for stars. and that’s rarely a positive. does that mean Forrester’s wrong? tough to say. if all the monks, for example, blogged at completely unrelated properties, that might be an issue. but you need to grant folks latitude to permit them to grow. @William Vambenepe: indeed, and that’s a point i should have made above. thanks for remedying the omission. we observed that at RedMonk. a single, corporate blog inspired James and myself very little. it was once we gained our own venues that things really took off. and it’s not clear that that lesson is fully understood in this case. @David R: thanks, appreciate the kind words. glad you found it of interest. Thanks for the well thought out post. As part of the social team at Forrester, I can tell you that each analyst will have their own branded blog on the new platform. Their blog is a a place for them to have an individual voice and explore their topic areas. The analysts are also being encouraged to comment and particpate on non-Forreter bliogs if it helps further their analysis and research. Use of Twitter is also encouraged. The star model has existed long before the emergence of social tools. And Forrester has a long history of building stars. We help our analysts secure major speaking gigs, promote them and their research through our own marketing efferts, and feature them at our events. We even help secure book deals like for Josh Bernoff. So by adding personally-branded blogs to Forrester, we are continuing the tradition of using the Forrester brand to help build analyst’s individual brand. I just saw this so sorry for the late comment – better catch up on my feed reader! The question to my mind is: should an analyst firm act like a syndicator of individual analysts’ product, or is the firm’s product more than the sum of its parts? As someone who has been responsible for buying a lot of analyst research, my experience is that a firm’s product is actually less than its parts. I greatly resented the cost of services in which a stable of analysts contributed to a “practice”, but only 1 or 2 of those analysts were truly original thinkers with critical insights worth purchasing. I would have been much happier buying analysis a-la carte, picking and choosing what I bought based on my own value assessments of analysts. But the firms that packaged analysis into practices ended up with a much bigger slice of my budget than the firms offering a more a-la carte approach. Less value to us at a higher cost. No different than a music album, except that now I can buy the individual tracks I like, and leave the filler behind. If only I could have done that when I was responsible for buying analysis! Analyst stars need firms less and less. They can collaborate with their peers, publish their content themselves either for $ or as Redmonk does, as a concrete demonstration of the insight one can buy when engaging the analyst as a consultant. Firms face a similar problem to all the other syndicators of content out there: the value of distribution and aggregation is disappearing. It seems to me that Forrester has decided to circle the wagons with their decision. We know where that leads though. I think they’d be a lot better off making their firm a uniquely comfortable place for superstar analysts to hang their hats. In my own post on this topic last year at http://bit.ly/tOHjw I noted that participation in the dialogue (interacting on their own “open” as well as others’ blogs, instead of sitting inside the firewall waiting for clients [only] to have a conversation) was one of the areas that seemed to be lacking within the large firms, whose use of the social media seemed primarily broadcast-oriented. Cliff’s assertion is therefore very encouraging, and one hopes that those analysts who have always been participants will be joined by more of their colleagues.